It must be mini pen week here at The Pen Addict. 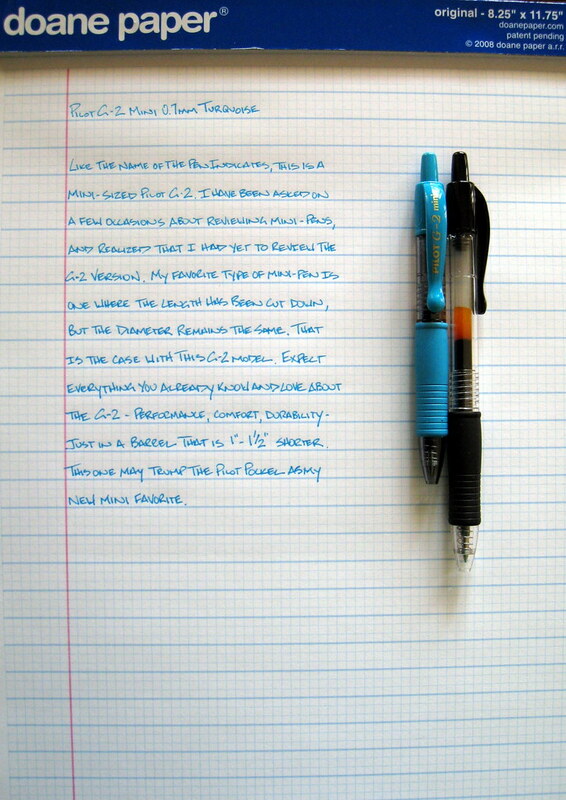 The Tombow Pfit ballpoint was reviewed earlier this week, and now it is the Pilot G-2 Mini's turn. The G-2 Mini is available at most big box retailers and office supply stores, but I grabbed this turquoise model from JetPens (of course!) because I prefer to try just one of the pen I am interested in as opposed to buying a four or ten pack right out of the gate. Lucky for me, this pen performed great, and many more G-2 Minis are in my future. Since this was a G-2 model, I assumed the performance would be nice, and I assumed correctly. The 0.7mm gel ink cartridge glides across the page, and the barrel is just the right length for me to write with comfortably. Turquoise is not normally the first color I go for, but this shade is deep and much nicer than I had hoped. I haven't tried many of the different color G-2 inks, but the way this one looks makes me want to try them all. The only thing that would make this pen better for me personally is if it came in an 0.5mm version, but I have the Pilot Pockel to pick up that slack. Does anyone use a mini pen regularly that they like better than the G-2? Click here for the XL photo review. Posted on March 26, 2009 by Brad Dowdy.